Whether it is for the daily walk or more adventurous outings like camping trips, pets help get us outside and active. This is good for everyone until there is an injury or emergency. Then the stress begins and leaves you wishing for the comforts of home. Here are some tips to make your outdoor time with your pet as safe as possible. Bringing along a first aid kit should be a given. A first aid kit customized for your pet is even better. An extra supply of any current meds, or medications they might need, such as a vet-approved pain reliever (example: Rimadyl or Caprofen) after extra swimming and hiking are especially useful. A first aid kit is great, but if you don’t know how to use the items, it isn’t of much use. When your dog is in pain and the situation is tense, staying calm and putting previous training to work is much more effective than guessing at what the best course of action should be. My vet colleague and I do a “wilderness first aid” class at our local REI outdoor supply store – check your outdoor stores for similar first aid intro classes. Check with your local Red Cross chapter or community college for more in-depth training on pet first aid. There are many pet first aid apps available for your phone, too. Some are free, some are a nominal fee. Are your pet’s collar tag and microchip registration information up to date? It is important to remember that cell phones may not work in the places you are camping. Adding a phone number of your vet or someone in town who could reach you is a good idea; either by adding a new tag or affixing the info to the current tag(s). Keeping your dog’s diet as ‘normal’ as possible will help prevent diarrhea, upset stomach and pancreatitis. Fatty trimmings from campfire cookouts (and the yummy, drippy foil found on the ground! 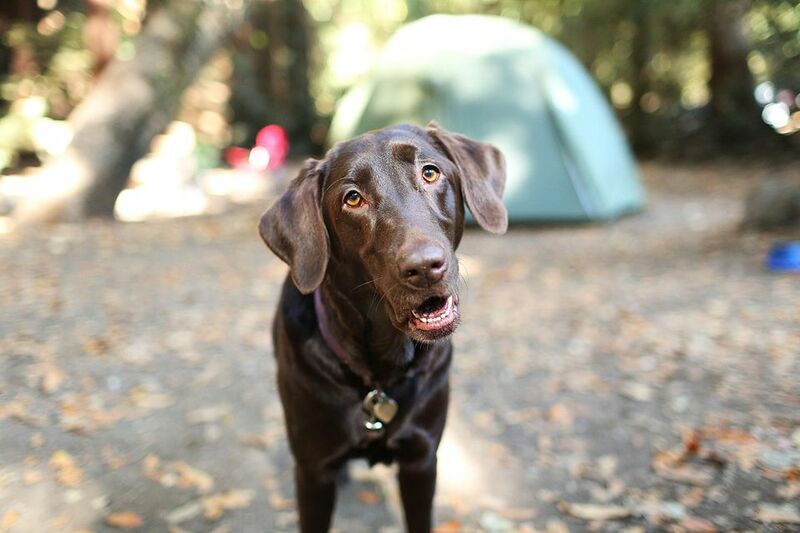 ), corn cobs, and other camping feast foods can spell disaster for your dog. Keep your pet in close range to avoid mishaps with wildlife – bites and unfortunate encounters with porcupines skunks. A sudden downpour or swim in the lake can make for a hypothermic dog with all of that wet hair as temps drop. Bringing a supply of towels to have on hand helps with the comfort factor, too. Towels and rags are also great for emergencies -- as bandaging or cleaning up materials. Your pet should be on a monthly flea and tick preventative, but if not, check with your vet about the best product for your pet and where you will be traveling to. Never use products intended for humans on dogs and cats. Extra caution for dog and cat households too; products should never be used on a species it is not labeled for, and some dog flea/tick products are toxic to cats. A tick removal tool, such as the Tick Twister are also a necessity for many areas -- good for removing ticks from pets and people. Dogs get to know and anticipate the normal routines of life very quickly. Travel and camping disrupt that routine. Most dogs go with the flow and are totally fine with this. Some aren’t. You may notice pacing, panting and even trembling if your dog is feeling out of sorts. And if there is a sudden thunderstorm or fireworks, and you may be up all night with a dog who is very frightened and won’t settle down. Pack your big bulky dog beds. Your dog will take one look at the familiar beds and say “oh good that is HOME” and settle right down. Tip: Try Adaptil (DAP) spray to spritz on beds, bandanas, or anytime you need a little extra calm and reassurance. Also try the Adaptil (DAP) collars – see the review here.